Respire was my first university project. 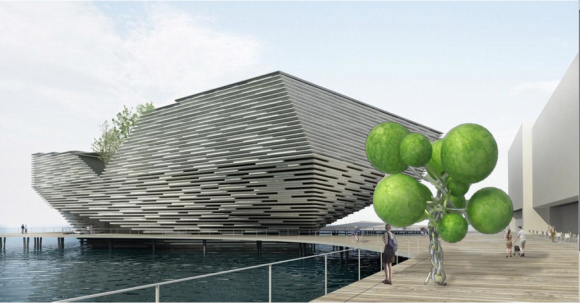 The brief asked us to design a new concept for a renewable energy source that would be located at the proposed site of the new V&A in Dundee. Since the V&A is an art and design museum, I felt it was appropriate to make my design quite sculptural. The inspiration for the ‘tree’ design came from people’s attitudes to renewable energy – particularly those opposed to it – saying that wind turbines are scarring our countryside. I wanted to show that renewable energy can co-exist with nature in harmony. The ‘leaves’ of the tree are solar panels that harness energy from the sun – similar to actual leaves in the process of photosynthesis. Underneath the decking is a biometric pressure system and a hydro-electric turbine harnessing water energy from the River Tay below. This isn’t a million miles away from the roots on a tree taking sustenance from water below the surface of the earth. The structural form of the tree creates a renewable energy concept that is both functional and interesting to look at. I hope that such a concept might encourage people to think about renewable energy in a different way and help to show that technology and nature and work together for a better world.